Recent advances in next-generation sequencing (NGS) technologies have brought a paradigm shift in how researchers investigate common and rare diseases. While whole genome sequencing remains costly, whole exome sequencing (WES) is less expensive and has recently been introduced into clinical practices such as disease treatment, screening and prenatal diagnosis. Recent success of WES has uncovered numerous disease-causing mutations and disease-predisposing variants throughout the genome. Here we report four cases of Mendelian disorders observed in affected families. Using WES and bioinformatics techniques, we identified variants in each disease case, which co-segregates with the disease and are compatible with the phenotype. Dr. Jingga Inlora is a postdoctoral fellow in the Snyder lab. Her research focuses on using next-generation sequencing and bioinformatics approaches to identify rare heritable mutations in Mendelian disorders. Using similar technology, she also studies how environmental exposures, in particular, air-borne microorganisms, affect human health. Dr. Inlora received her PhD in microbiology and immunology from the University of Michigan – Ann Arbor in 2015 where she studied the assembly process of HIV-1 particles and the evolution of retroviruses. 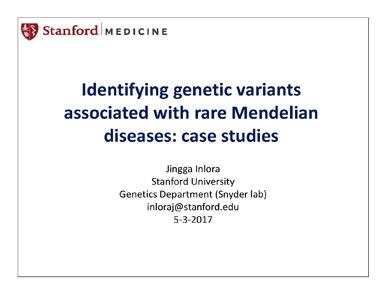 Dr. Inlora’s abstract focused on identifying genetic variants associated with rare Mendelian diseases.